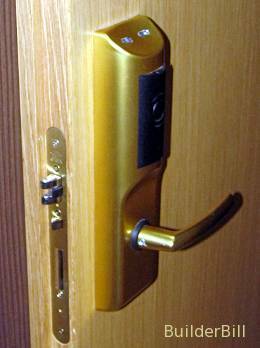 Door hardware devices to keep doors secure from entry by unauthorised persons. Can be operated by keys or electronically. A small protective plate around a keyhole. A small cover or face plate around a lock cylinder, recessed for the cylinder. In door furniture or hardware a metal plate fixed to the face of a door at the lock which the lock spindle passes through. It sometimes provides a bearing surface for the handle or door knob. In door furniture or hardware a metal shaft usually of square section that passes from the handles or door knobs through a lock or a latch. In door furniture or hardware a metal plate that covers the body of a lock, latch, flush bolt or other fitting . In door furniture or hardware a metal plate that receives and holds the moving section of a lock, latch, or bolt etc. .
Locks are normally fixed to doors. Strike plates fix to the door frame. The two are inseparable, one without the other is useless. Manufacturers package a lock so that it contains everything needed to fix it, including lock and key, screws and strike plates. 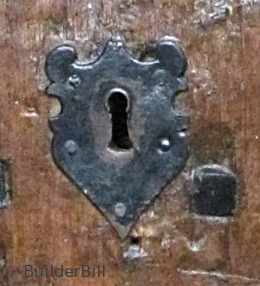 Door Locks : An medieval brass rim lock. Door Locks : A hotel room lock. A mortise lock that reads from a swipe card and unlocks the lock itself, rather than the one on the on the previous page which used an electric strike. Note the semicircular ends to the faceplate. This make recessing the door easy and quick with a router type of jig. The lock above despite it's age has feature that are still used in locks today. A lock/latch feature. The bottom knob operates the bevelled latch for normal use, but when the key is turned it is locked in position. A dead lock or dead bolt feature operated by the smaller top knob. 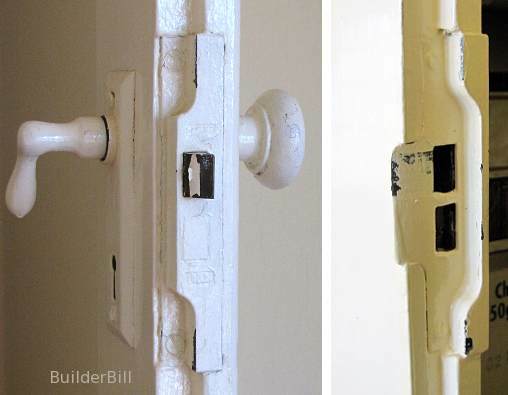 Strong fixing via the three bolts that go through the door and the body of the lock. Probably the oldest form of mechanical locking device that is fixed directly to a door face. It may or may not be partly mortised into the edge of the door. Smaller ones that provide extra security to the main door locks are sometimes referred to as a Night Latch. A lock that is set into a slot or mortise in the door. Refers to the moving section of a lock. 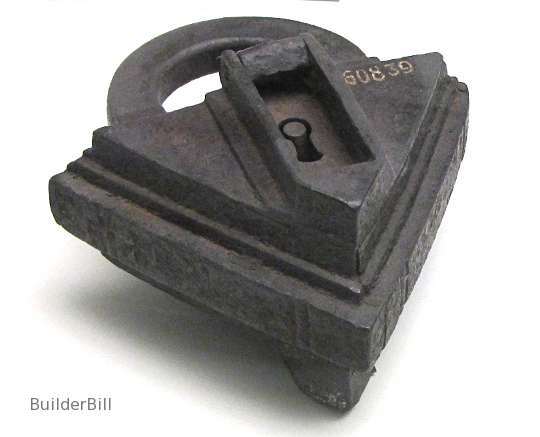 It is of rectangular section with a square end and of more solid construction than the bevelled lock/latch. It can be incorporated into another lock or as a stand alone. It can be operated by a key or by a lever and it can be fully mortised or face fixed. Can be read as one word or two. Door Locks : A composite shot of two sides of the same door showing another old rim lock and a slightly newer deadlock. 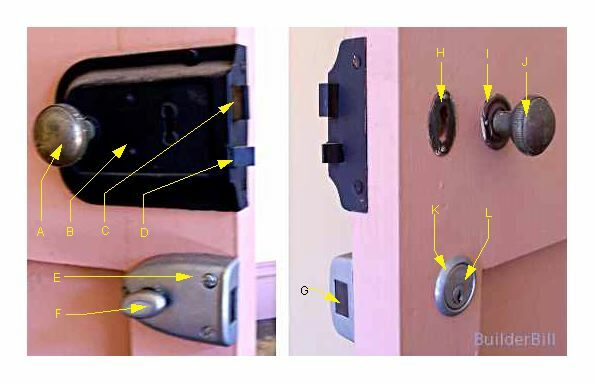 A and J are door knobs, B is the body of the rim-lock, C is the deadbolt, and D is the latch. H is the keyhole with the escutcheon plate, I is the Rose. E is the body of the deadlock with F as the knob or lever to operate the bolt. G is the bolt itself and K is the Cylinder Rose that holds L the cylinder in position. The top lock here is again a rim lock. 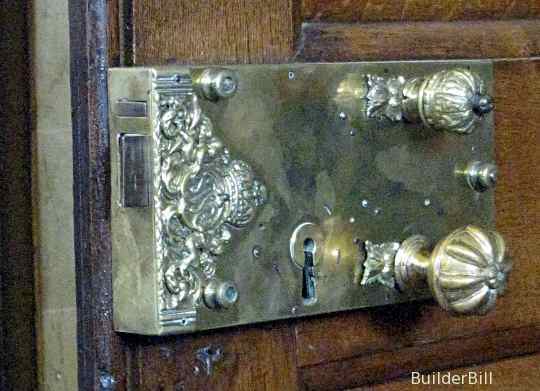 It has an enhancement on the old brass one at the top of the page in that the edge of it is wider allowing it to be set into the edge of the door so that two screw are added at right-angles to the other fixing screws giving extra strength. The other lock below is a stand-alone deadlock. This is the generic type of lock and latch that we used to call when I was a lad, a "Y__e Lock". Many other companies now use this design, but credit has to be given where it is due. Linus Y__e Jr. patented this type of Pin and Tumbler Cylinder Lock in 1865. It is said that he got his inspiration from records of Ancient Egyptian wooden locks of a similar design. Most modern locks that rely on metal keys for activation use this system because of the enormous savings in manufacturing costs. The old locks on this page where built each one to suit a certain key. With the introduction of separate cylinders only the cylinders where different, the bodies where all the same. We talk about changing the locks when we move into a property. We don't change the locks, we change the cylinders At a fraction of the cost. We can build a building with many hundred of doors and locks and we install Construction Cylinders. Most often these are cylinders that have been used many times and they are all keyed alike for convenience. When the building is occupied and the Various owners or lessees take over they can have their own cylinders installed to their own configurations. See the next page on special keying. The word Escutcheon comes from the medieval term for a shield, particularly in heraldry where it can mean a shield bearing a coat of arms. These small plates protect the wood, disguise any sloppy work by the joiner and help to guide the key into the keyhole. If you look at the photo of the pink painted door above you will see a small keyhole escutcheon for the rim lock and also below it a cylinder escutcheon. These are an essential part of mounting these types of cylinder. They hold the cylinder in position, cover the hole clearance and transfer the pull of the cylinder mounting screws to the surrounding door. Fitments that enable a standard mortice lock to be fitted to double doors. The composite photo above shows a rather tired and painted over mortice lock and strike plate for a pair of double doors. It is in a 1930's era house and the style is definitely out of fashion these days. It does serve to illustrate what a Strike Plate is and in this case it also shows what a Rebate Kit looks like. Door Locks : A small Button Lock to a desk drawer. The tiny lock above is just about all cylinder. There is not much else to it. There is a spring inside the unit that holds the lock in the open position as seen in the photo. To lock it the drawer is closed and the button pressed in and the key turned. This engages the small metal angle that is the receiver.